Are you a Food Spotter? A Food Spotter is someone who shares foods they love which enables Food Seekers to find whatever they’re craving. Whether you are a Food Spotter or a Food Seeker, FoodSpotting is a place online where you can find and share dishes that you love. 1. It’s just about the food: It’s not about the place, the price, the surroundings, the crowd or the nutritional value — it’s just about good food and where to find it. 2. 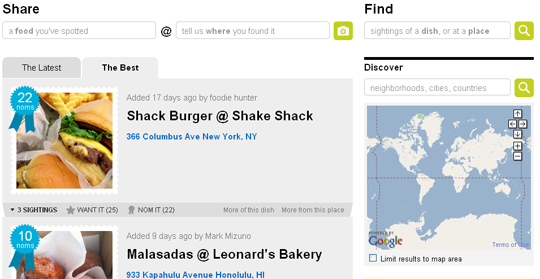 Good food can be found anywhere: Foodspotting was built to work in any city, small town or country from the start. It encourages exploration — trying new things vs. following the crowd. 3. Meaningful ratings: The blue ribbon (the “nom”) means more because it’s hard to get. Foodspotters earn the right to nom foods by demonstrating expertise and building up reputation points. 4. Not every food, just the good food: Foodseekers aren’t interested in the foods that you hate, they want to know what you love. They believe people will tend to spot the foods that they like and to nom the foods that are amazing. 5. Celebrates and integrates with what you’re already doing: Whether you take photos of every meal or are a self-proclaimed expert in a certain dish, we want to reward what you’re already doing and make it useful to a broader community. This is another great way of sharing your favorite food and where to find them. If you’re looking for a new dish you want to try out near your area, visit the site and see what the community of Food Spotters has shared. You can become a Food Spotter yourself by photographing dishes that you’ve discovered and love and share it on FoodSpotting. An iPhone app is scheduled to be released on February 2010 for easier Food Spotting.